What a great gift idea and just in time for that special person on Mother’s Day. 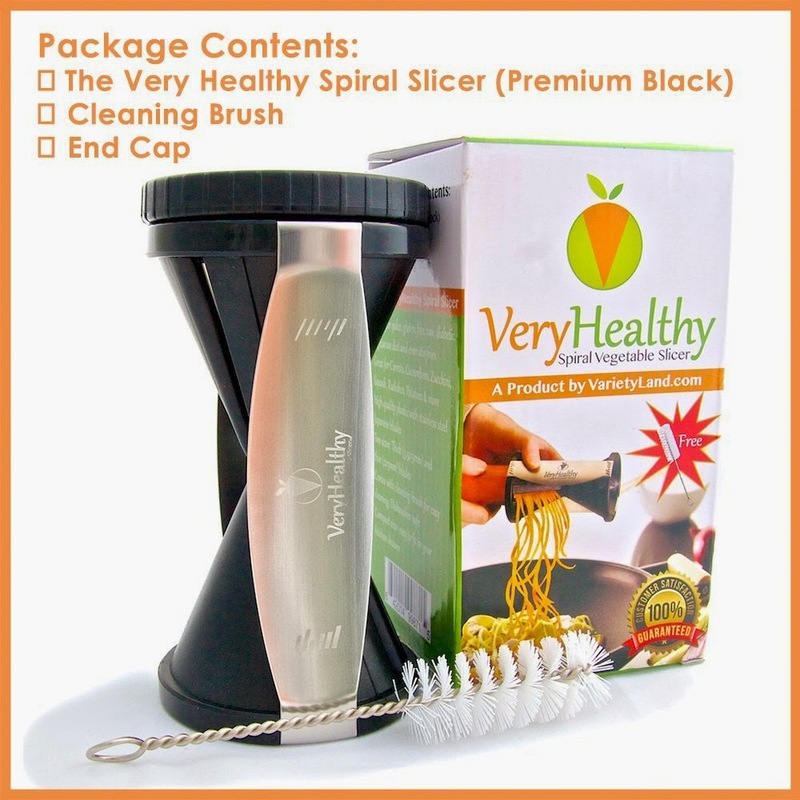 The Very Healthy Spiral Vegetable Slicer comes with the Spiral slicer (Black); an Ed Cap; cleaning Brush and a bonus recipe eBook.Oma found this premium kitchen tool perfect for gluten free spaghetti and stir fry dinners. Just prepare your veggies by washing and peeling if necessary. Then you can easily insert the vegetable into the slicer and firmly push and twist to produce long vegetable strands. to get 35% Off your purchase. THE HEALTHIEST MOTHER'S DAY GIFT OF 2015: Every mom dreams of having the special power to be able to turn vegetables into spaghetti noodles, don't they? Psst... Use this Secret Code 'MOM35OFF' to get 35% Off your purchase. 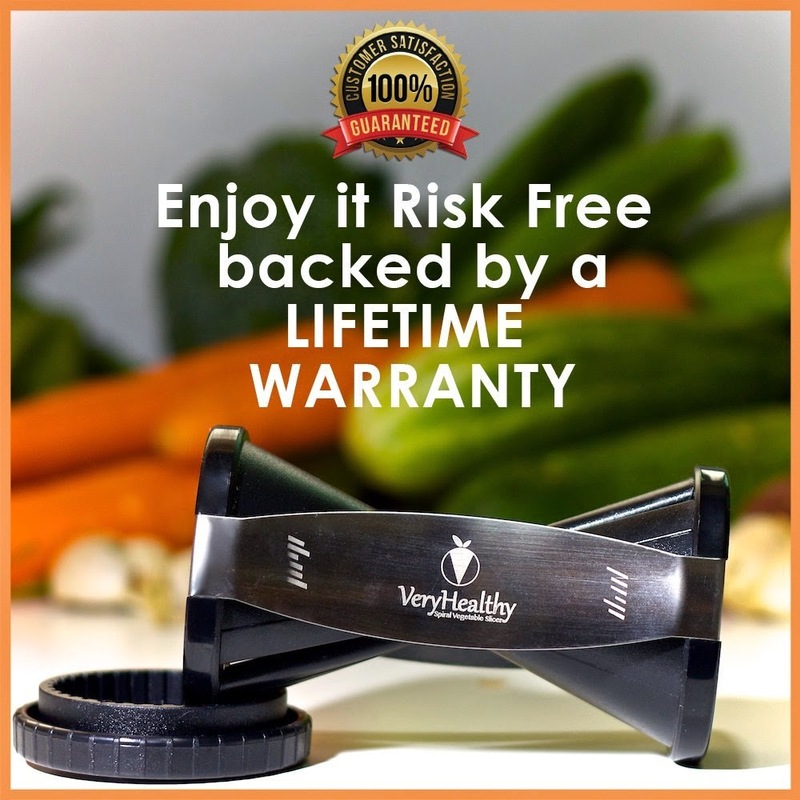 BUY WITH CONFIDENCE: We are so confident you're going to love your Very Healthy Spiral Slicer we're offering it with a 100% Worry Free LIFETIME Guarantee! If you have ANY problems with your Spiral Slicer FOR THE LIFETIME OF THE PRODUCT simply let us know and we will refund every penny of your purchase. FUN & EASY TO USE: No need to assemble, no batteries required. Simply pop in your vegetables and start twisting like a pencil sharpener. You'll be delighted at how easily and effortlessly your Very Healthy Spiral Slicer produces perfectly beautiful veggie noodles. It is the perfect combination of cooking and arts & crafts. You will be amazed at the creative dishes you can create with it and your imagination. DURABLE DESIGN: Hold the Very Healthy Spiral Slicer in your hand and notice just how comfortably your fingers wrap around the handles. The sturdy blades are fashioned from 100% Japanese stainless steel. It won't rust, break or lose sharpness. 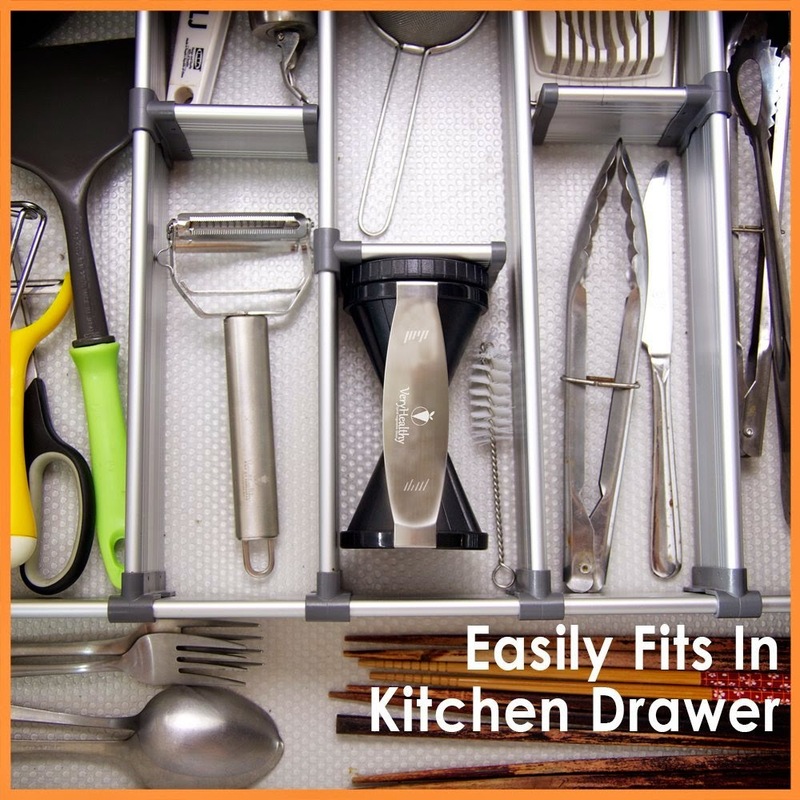 We've meticulously designed this kitchen tool to serve you for years and decades to come. COMPLETE BUNDLE: We've included a cleaning brush specially designed for your Very Healthy Spiral Slicer to make sure the cleanup is a breeze. Your purchase will also come with 20 Spiral Slicer Recipes giving you lots of healthy meal ideas and a Starter Guide to help you choose your veggies and get the most out of the Spiral Slicer. “Oma Loves U!” has teamed up with Variety Land to conduct a giveaway for her blog readers. One lucky fan will win a Healthy Vegetable Spiralizer (ARV $ 15.75). I would use it to make Creamy Avocado and Spinach Pasta with zucchini noodles. I would make glazed carrots. I would prepare carrot noodles, mmmmmmmmmm. I will spiralize some potatoes. I'd make some curly sweet potato fries with mine! I would make spinach noodles and make spaghetti. Curly sweet potato fries with a chilie season. I would make a veggie tray or some pasta salad. I would prepare zucchini first. I would use it for carrots to add to my delicious potato salad ! Yum! I would make some zucchini noodles. 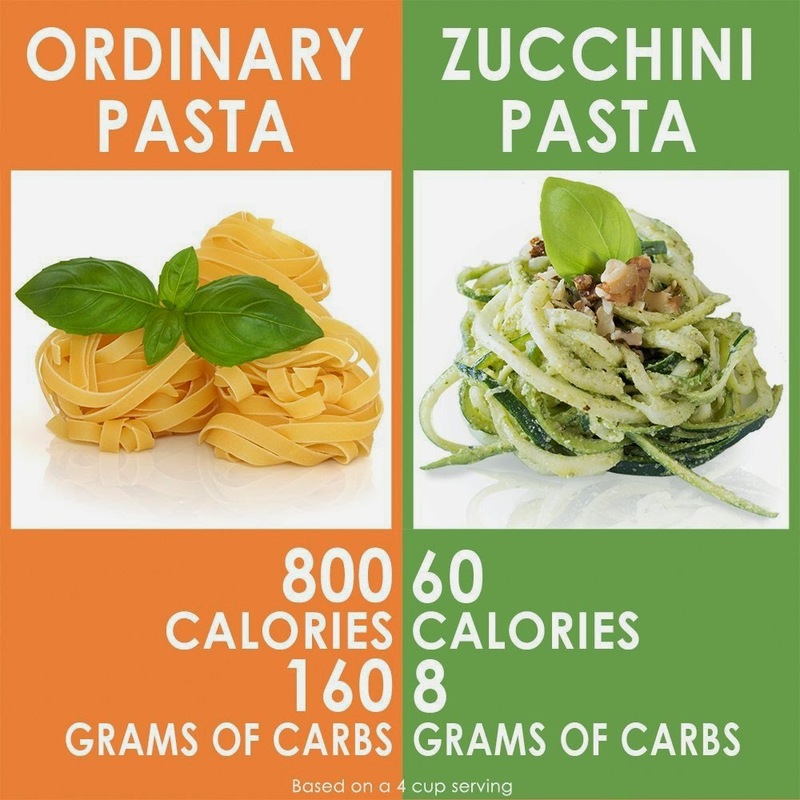 I would definitely make some zucchini noodles! I have seen several neat recipes for them on pinterest! Fried squash or apples for dumplings. I would prepare some vegetable soup first and foremost, because I like to use it to the ultimate factor.